makes it easy to send parcels quickly and cheaply to South Africa from the UK. From economy to express shipping, we offer you a range of discounted options with the biggest and most reliable South Africa couriers. Whether you’re sending from the UK to South Africa, or importing from South Africa to the UK, shipping a small package of documents or gifts, or a large commercial shipment, get your package to South Africa speedily and enjoy premium service without the premium price tag. The service was an easy task, everything just came up as you needed it.. I had to send a parcel to my daughter in SA, and from start to finish the process and service was brilliant. and the courier in SA then made contact with my daughter to inform her of the expected arrival time of the parcel. Very easy to use. Really liked the option of drop off points so I didn't have to wait for a courier all day. Easy to use website, I was informed of my parcels whereabouts all the time. I would use Fastlane again and recommend to my friend. Absolutely superb service. Going to recommend that someone who I buy from in Southhampton switch to Fastlane Couriers. A pleasing experience. I would recommend this company. Efficient service, great tracking system, easy to use, quick to setup and very timely delivery, well recommended! Whether you want to ship express, or save more money with an economy delivery, shows you all the options, from a range of expert couriers, so you can pick the service for you. Get instant quotes from the best couriers. Discover prices up to 60% cheaper than booking direct. Pick the speed of delivery which suits you. Our 30 years of experience working with the world’s best couriers means that we’re able to offer great service at cheap prices. We can deliver to more than 220 countries, with massive savings over standard postage to every destination. With same day collection and express shipping available, your package can be in Cape Town or Johannesburg in just two days’ time. And we don’t just ship from the UK to South Africa, you can also import a parcel from South Africa to the UK, while enjoying the same great shipping options and fantastic savings. Fast and reliable 2-4 day delivery. Great deals on 4-6 day delivery. If you’re shipping to South Africa there are two main centres where your parcel will enter the country; Cape Town and Johannesburg, and any customs charges you have to pay will depend on which of these your package goes to. They will be subject to duties and taxes, though there is a small allowance for low value items to pass through without fees. Make sure to properly declare your goods when shipping to South Africa in order to minimise delays. South African customs are very strict, so make sure you declare a realistic value on the items your shipping, otherwise they may get delayed. It’s important to properly complete the customs paperwork that generates during the booking process – this is all required for your parcels to clear customs when shipping to Kenya. Make sure to include a full description of your goods and their value. If you’re sending a parcel to South Africa from the UK we can collect from you on the same day you book, provided you do so early enough. If your package is longer than 180cm, or heavier than 50kg you will need to give us 24 hours’ notice before we collect. Collections are made between 9am and 7pm, we can’t tell you the exact time we will pick up your shipment, but you can use one of our convenient drop off points to save you waiting in for a courier. We deliver between 9am and 7pm on working weekdays, so it’s often better to send your parcel to a place of work rather than a residential address if appropriate. Deliveries to residential addresses may also incur a small charge , which will be included in your quote. As with collections, if you think you will need equipment to help get your shipment off our van then contact us in advance. We don’t deliver on public holidays, so be sure to check our list of South Africa’s national days below to avoid disappointment. At every stage of your shipment’s journey the barcode on the label will be scanned to record its progress. When you enter your parcel tracking number into our tracking tool, you’ll be able to keep up to date with its progress and see if any issues have occurred. And should anything hold up your delivery we will email you to let you know, as well as keeping your recipient in the loop, so they know when to expect the parcel. Our UK-based customer services team are also on hand to answer any queries you may have. There is a gift exemption in place when sending presents to South Africa. If your gift is worth less than 400 Rand, then it will pass through customs without having to pay duties or taxes. Parcels can only be sent as gifts between two individuals. If you’re sending a parcel as a gift to South Africa, it’s important to make this clear in your customs paperwork. Sometimes you need to send an item that’s bigger than a parcel you can simply hold in your hand. If you’ve got a bulky package which weighs up to 1,000kg, or is shorter than 270cm on its longest side, then can deliver it to South Africa for you as air freight. Just remember to book at least 24 hours before you need your oversized package collected, and be on hand when your courier arrives to offer assistance in loading and unloading your package. There are all sorts of delicious things to eat in South Africa, but if you’ve had enough of Biltong, Boerewors or Malva pudding, and yearn for some familiar flavours, let help deliver you a small slice of home. With it’s easy to send food to South Africa, as long as you stick to a few simple rules. If you do, there shouldn’t be any trouble clearing customs. Whenever you ship internationally your parcel is going to travel with a lot of other packages across long distances. This means that it is inevitably going to experience a few bumps and knocks. The only way to completely ensure that the contents arrive in South Africa undamaged is to make sure they’re packaged properly before you send. If you can, try to use a brand new box – old or used boxes often have weaknesses that aren’t immediately apparent. recommends using double corrugated boxes for any goods that weigh more than 10kg. Every item in the box should be individually wrapped in packaging material and then suspended in the box – no part of your goods should be making contact with the walls of the box. Make sure that they are tightly packed, and nothing moves around if the box is shaken. Close up the box and use strong packing tape to seal it. Wrap in a Union Flag style, wrapping fully around the box at least three times. You can then attach your shipping labels as securely as possible and with all information clearly available. If you’re using an older box, make sure that there are no old labels still attached before doing so. Does collect duties and taxes? No, duties and taxes are applied by customs when your parcel arrives at the South African border. The receiver will be billed for these fees and they should pay them directly to customs. When will your courier deliver in South Africa? All our couriers deliver between 9am and 7pm on working days. If you want to get a signature for your delivery, then choose the ‘signature required’ upgrade when making your booking. How quickly can I get a parcel from the UK to Cape Town? Depending on the option you pick our express delivery services to South Africa take between two and four days. Can I send food to South Africa? You can send food as long as it won’t go off in the next six months. See our guide above for full details. Can I send a big package to South Africa with ? Yes, we can deliver shipments up to 270cm in length on their longest side, and 1,000kg in weight. For larger parcels we need 24 hours’ notice before collecting them and you will need to ensure they are properly packaged and on a pallet where appropriate. Which courier firms does partner with? We pride ourselves on only working with the world’s most reliable couriers, so you know that, even though you’re paying an economy price, you will receive a premium service. Our courier partners include DHL, DPD, FedEx, TNT and UPS. If you want to offer shipping of an eBay listing to South Africa you can check the cost with our eBay shipping calculator. Just remember, your eBay item must not be prohibited by South African customs. Does offer a business service? If you want regular shipping for your business then will work with you to provide a solution. Our business package includes extra discounts and premium support, Find out more here. 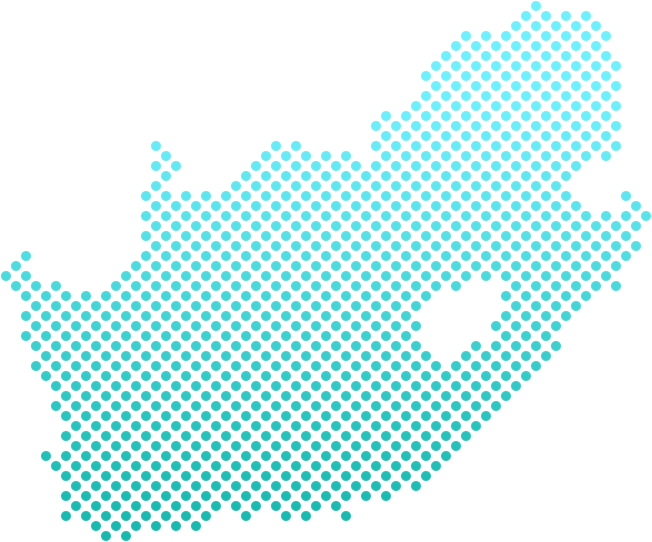 South Africa is a big country, with lots of areas that are considered remote and take longer to deliver to. So if you’re sending a package or gift to areas like Prince Albert, Nieuwoudtville or Port Edward, it will take another day or 2 to deliver. When you get a quote, we’ll always quote an accurate delivery time, based on the destination your sending to in South Africa. .